I love Rachel Harris's books! She's insanely talented at sweeping you away into her stories and making you feel lost in the characters' lives and what's happening to them. I didn't want to put My Not So Super Sweet Life down at all. Short and sweet, this book had me giggling and smiling the entire time I read it. This is the third book in the My Super Sweet Sixteenth Century series, but there's enough explanation about the storyline that it can be read by itself - although I definitely recommend reading the first two books first to really learn the characters' backstories. It was so much fun to be back in Cat's head again. As much as I loved Alessandra in the second book, I really missed Cat's point of view from the first book, so I was thrilled that this book was about her. She's a strong, funny character, but in this book she has to deal with her trust issues and insecurities if she wants to move forward in her relationships with people like her parents and her boyfriend Lucas. I loved her character development and the way she eventually learns to open up and start trusting people. We also get Lucas's point of view in this book. I didn't really know what to expect of this, as he's a pretty minor character in the first two books, but I LOVED him in this one. He has to deal with his own problems concerning his family, but he always puts Cat first and makes sure that he's there for her no matter what. He's so protective of her, and he sees her for who she really is and believes in her when no one else does. I know it sounds like their relationship is cliched, but Harris totally pulls it off and makes the romance swoony and believable. This book is under 200 pages, but despite the short length it still felt a complete, fleshed-out story. Perhaps it wasn't quite as exciting as the events of the first two books, but I appreciate that it was more character-driven. 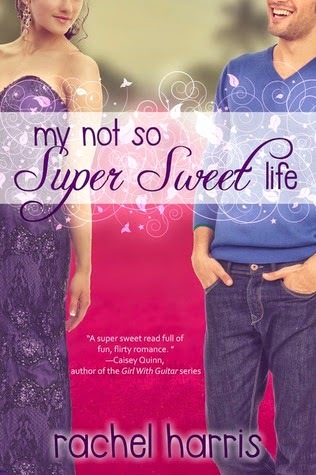 I thoroughly enjoyed My Not So Super Sweet Life, and I can't wait to delve into more of Rachel Harris's work. If you're looking for a light, adorable read, pick up a book in this fun series! *I received a free copy from Entangled Teen in exchange for an honest review. Thanks!